All Saints Church serves the village of Little Stretton with the hamlets of Minton, Marshbrook and Hamperley. The southern part of the parish is deeply rural with 11 farms. The church was built in 1903 from a mass produced Manchester flat-pack and given a mock Tudor style exterior and thatched roof. An extension was built in 2012 to provide a fully fitted kitchen, disabled toilet and loft storage facility. 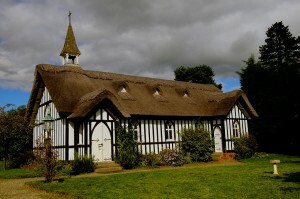 The church is open during the day throughout the year and attracts many visitors, especially holiday makers coming to the Stretton AONB. We are proud to be part of the Church of England and also part of the parish of Stretton, under the leadership of the Rector of Church Stretton. We hold traditional services, using the language that has been tried and tested over centuries. This provides worship not only for the residents of Little Stretton, but also for those from the whole parish and beyond who seek traditional worship. 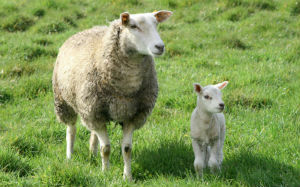 An appropriate feature in the church for a sheep farming area is a “Shepherd’s Trail” based on Psalm 23 using photographic narrative pictures for each of the six verses. A traditional service using BCP or CW Order Two is held each Sunday, attracting local residents and those from the wider parish who seek the traditional form and language of worship. The church is fortunate to have the assistance of local retired clergy, providing pastoral support and a monthly Holy Communion service at the Residential Care Home in the village. 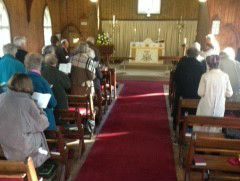 During Lent a local study group is held for members of the congregation. Although the church does not have a choir it does have the use of a digital organ. Retired professional musicians act as church organists. Music plays a significant role in worship. At the Harvest Festival and Christmas Carol Services, the services are preceded by a cooked lunch in the village hall – always well attended. During the annual Christian Aid week a Soup and Pudding lunch is held in the church as part of fund raising for the charity. 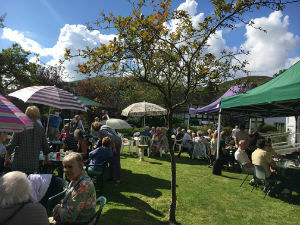 An annual event which involves members of the church, people in the village, pubs and surrounding area entitled, “Teas to Please,” is held in the church garden during the three afternoons of the August Bank Holiday. It takes the form of home-made refreshments, stalls, games and musical entertainment. This is well known and a major fund raising event having been held for many years. Average proceeds have been in the range of £3,000 to £5,000; of which half is given to church and half to secular charities. All Saints Church though small is a humble, homely abode with a caring community sharing love and fellowship with God and one another. We believe the truths of the Bible and seek to bring people to faith in Jesus Christ, and to help people grow as Christians through teaching, prayer and sacraments. At least 10% of income is given away to Christian missions and other charities. There is a warm welcome for you at All Saints.